Inhabited by about 6,000 people of Uygur, Hui and Han, Grape Valley has more than 400 hectares of cultivated land, including 220 hectares of grape farms. Peaches, apricots, apples, pears and melons also grow in abundance. In recent years, the remote township in Turpan county, has become one of the hottest tourist destinations in Xinjiang, thanks to its lush vineyards, sparkling springs, colorful ethnic culture and delicious foods. "Booming tourism enhances the local economy and helps improve employment and increase income of local residents," noted Aikbayer Kahar, deputy chief of Turpan Tourism Administration. Niyaz Rehip, a Uygur farmer in the Grape Valley, has much to say about the positive changes in his life. Since his childhood, Rehip has lived in the Dapusangai village in the south of the 8-km-long valley. "Before running a household resort, the annual income of the whole family was less than 8,000 yuan. And that's only enough for us to make ends meet," recalled Rehip, who has a son and five daughters. In 2004, with a subsidized loan of 30,000 yuan from a local bank, the grape farmer was among the pioneers to turn his own yard into a mini-resort, combining pastoral scenes, lush fruits, Uygur foods, folk songs, dance performances and cheap accommodations. 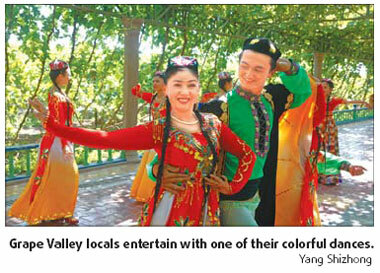 Now, the family can earn as much as 50,000 yuan a year, mainly by receiving tourists. The tourists begin arriving in March and April, and the number peaks in August or September, noted Rehip who has hired three waiters to help during the busy lunchtime. "This year, I am expecting a brisk business," said Rehip, who received over 600 tourists during the May Day holiday and took in about 6,000 yuan, which was "a good start for 2009". A growing number of young farmers who have worked in big cities as migrant workers are also returning to open their own household resorts. "If I can make more money in six months in Grape Valley, why bother to stay away for so long as a migrant worker?" asked Yang Jian, a farmer from the Adasi village. Some 179 household resorts have now opened in and around the Grape Valley, providing job opportunities for about 10,000 local people, according to Kahar.